In Podcast #236 I answered four listener questions. Below you will find the audio of all four questions and the transcript for question #3. Please bear in mind that I speak in a slightly more informal fashion than I write, which you will notice in the transcript below. The transcript has been edited slightly for clarity. If you have a question you would like answered in a future podcast please let me know. Question: For people who don’t like numbers and tend to measure intensity in very subjective terms, how do you guide them to more meaningful/useful measurements? 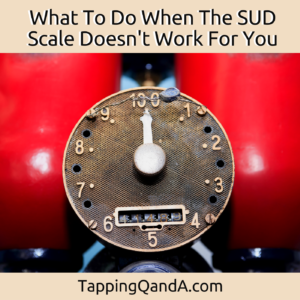 When he came up with EFT Gary Craig used the measurement called a SUDs level, which stands for “subjective unit of distress”. What is really interesting in this question is it feels as if when we’re using numbers we’re giving something that’s concrete because it’s measurable and it’s a number. But the truth of the matter is that even when we are putting a number on something, it’s still subjective. From the very beginning recognize the fact that it’s not about getting something to a three from a seven and bringing it down, it’s more about creating progress and way of measuring that progress. Often times when work with children for whom assigning a numerical value to something is meaningless because they don’t have a conceptual sense of numeracy, other than knowing their age just because they’ve been told it. So instead will have kids use hand gestures, kind of like they’re showing me the size of the fish. How big is your anger right now? Or, how big is the nervousness in your stomach? Show me with your hands how big it is. And they really like that. Again, it’s subjective and it’s giving us this measurement. The thing that’s most important about using any sort of measurement is to give us feedback about the tapping we’re doing to see if we’re heading in the right direction. There are three types of responses that we can have to tapping. The first type of response is we feel better. I’m thinking about an issue. I’m thinking about a worry. I am not as worried and the number goes down. Or my anger goes down from a seven to a four. There’s less anger and the intensity of that emotion decreases from a seven to a four. The second type of response is there’s absolutely no change at all. We do a round of tapping, it’s still in the exact same spot. The third type of response that we can have is it can actually get worse, or it feels like it is getting worse. For example the first time I tuned into this pain in my knee it was a seven but now that I’ve tapped on a couple of rounds, it’s now a nine. Let’s take those three responses and just see what they mean. The first response, it gets better. Well, that’s what’s happening, it’s getting better and that means we’re on the right path. Once it has gotten better we now ask ourselves the question, do I have enough relief or do I want more relief to what is going on? Because sometimes the goal isn’t to get the issue to a zero. For example, when I’m at a holiday party and I see the sweets over there and I’m really craving sweets, I don’t have to eliminate the craving. I simply have to reduce the craving enough so that I am not tempted to eat the treat that I don’t want to eat, and instead I make a good sensible eating choice based on what I consciously want to do in that moment. I just want better, I don’t necessarily need it to go away. We evaluate, has it gotten better? Has it gotten better enough that I can make a good choice? If not then we tap again to clear as much as we need to. The second response is it stays exactly the same. If it stays exactly the same, that means is we’re either not tapping on the right issue, there is a reversal of some sort, or we need to get more specific. If this is the case we need to change our tactic so we can approach it in a different way. When we change our tactic and approach it in a different way, we put ourselves in a position where we can be more successful. The third response is it gets worse, the pain actually intensifies, the anger intensifies, the craving intensifies, and as odd as it seems, that’s actually a really good thing. Not that it’s more painful, not that it’s more intense, but it’s a really good thing because it means that we’re on the right path. Think of it this way. Your knee aches, you have had a knee problem for years and years. As you move through the day you don’t notice it but when you get home from work, you sit down on the couch, take off your shoes, lean back, and then all of a sudden your knee starts to throb. The sitting on the couch did not cause your knee to hurt more but instead because you’ve been dealing with the business of the day you’ve been thinking about all the things that are in front of you, and so you tune out the pain in your knee in the exact same way you’re tuning out the pressure your socks are putting on your feet right now. The instant I said “socks on your feet” you felt your feet. Even if you weren’t wearing socks you feel your feet touching the floor. You brought attention to it. Your socks didn’t magically cling to your feet in that moment, you just gave them your attention. There are times when we’re tapping when the intensity goes up because we’re just focusing on the issue that was already there and we’re shedding light on it so it feels bigger. In this process of tapping we’re just looking for feedback. I do a round of tapping I ask is it something that I think is better, is it worse, is it staying the same? That will dictate what my next step is. Either I’m done, or I need to tap more, or I need to approach it in a new way. You’ll notice in the question I’m not asking, is it more, is it less, I’m just asking if it’s different. If it’s different I will focus in on that difference, “It’s different how? Tell me how it’s different?” If there’s still something that’s hanging around we’re just going to tap on the new thing as if it’s the only issue in the world and it’s the first thing we’ve been presented. We simply know we’re heading in the right direction because it’s changed in some capacity. We create this graph to show exactly how much smaller the problem is. We’re simply saying, okay, compared to what it was before, how is it now? Are you satisfied with that or do you still want change? I have found if you approach it in that way it will put you in a circumstance that will allow you to be more successful in communicating the transformational process because sometimes transformation isn’t as easy as “If it was a seven and it’s now a five”.